This is the second installment in a series of articles about PlayStation All-Stars Battle Royale and its ongoing multiplayer beta. This part will focus on two of the characters, Kratos and Colonel Radec. Character balance in fighting games is the idea that all available fighters should be equally valid choices in the hands of a skilled player in the hope that the characters themselves disappear and the only thing that matters is which player is better. Every character should be equipped to deal with any situation if the player in control is good enough, but no character should be so good that players who use that character have an unfair advantage over those who don't. It's the holy grail of fighting games because it's so hard to achieve. The development team can spend as many hundreds of hours as they want trying to keep each character in line, but the second that game gets into the hands of the public, it's practically inevitable that "character tiers" will form as players begin ranking each fighter's inherent worth. At that point, all the developer can do is study player habits, paying attention to which characters get used the most and why, and then react with patches to try to maintain balance. And if the six characters in the PlayStation All-Stars Battle Royale multiplayer beta are any indication, the guys at SuperBot Entertainment have their work cut out for them. Before I go any further, I should note that this multiplayer beta is based on a months-old build of the game, so any number of changes could have happened between when it was being developed and now. But that doesn't really make much of a difference to players in the beta being harassed by Kratos's forward lunge attack or Colonel Radec's powerful sniper shot. I chose to start with Kratos and Radec for the character examinations because they've far and away been the most frequent characters I've seen players choosing. I've been in matches comprised entirely of either Kratos or Radec. That has happened to me literally zero times with any other character, and for good reason: Kratos and Radec are both totally overpowered. Kratos is hands-down the best character in the All-Stars beta. He's a fast, mid-range character who's perfectly equipped for almost any situation: He can stay on the outside fringe of a pile of close-range fighters and use his long, sweeping Blades of Athena attacks to dominate. He can bully his way in very quickly and send everyone flying with his Arms of Sparta spear. He has a long-range bow attack that doesn't interrupt other players' attacks (unless he charges it up) but can be used to build his super meter from afar. He can use the head of Helios to stun enemies, and he can use his Barbarian Hammer to knock down whole groups. And if all that wasn't enough, he can counter any attack with his Golden Fleece, including Radec's sniper shot. Kratos is a jack of all trades, and a master of everything. To SuperBot's credit, though, that's just staying true to who Kratos is as a character. 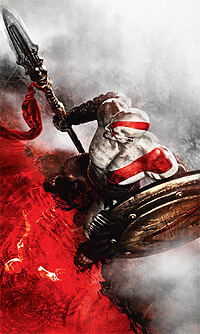 Even in the God of War series, Kratos is the definition of overpowered, taking down gods and titans with relative ease. In that context, it's hard to imagine that characters like Parappa the Rapper or Fat Princess would pose much of a challenge for the man who singlehandedly murdered half the Greek pantheon. And really, it's kind of amazing how accurate Kratos feels to his source games, right down to his bread and butter square, square, triangle combo. He has most of the same attacks and weapons, and given that the game even retains L1 as the block button, it feels almost exactly the same as the 2D-plane fights in God of War II and III. With so many tools at his disposal, it's easy to see why Kratos has been the most popular choice for players during the beta so far. He's certainly been the character that I've been gravitating to the most, and not just because of my unhealthy love for the God of War series, either, though that does play a role since I'm so familiar with his move set already. Every fighter in All-Stars has a ton of moves that are all incredibly easy to execute since all you have to do is hold the left analog stick in a certain direction and press a button, so really, it's not a matter of execution so much as familiarity with the character. And that's what I like about playing as Kratos in All-Stars: It really feels like I'm playing as Kratos, like SuperBot just lifted him from God of War III wholesale and dropped him directly in All-Stars as is. I don't have to change my play style at all. Contrast that with Mortal Kombat, where Kratos felt slow and clumsy and totally unwieldy. He just didn't feel like Kratos. And as a result, I almost never used him. So I've been playing Kratos exactly the way I do in God of War: I'm fast and I hit hard. I break up crowds with big attacks and I juggle individual players to maximize damage. I'm stylish. I move in close and let them try to hit me, but I counter it and punish them. And then I use his great assortment of supers to crush everyone. It really feels like I'm playing as Kratos. 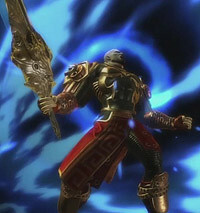 Kratos's level one super has him rush forward and slash with his Blade of Olympus, killing anyone in its path. You can combo into it with basic attacks if you're working on one player if you want a quick, guaranteed kill, but I vastly prefer trying to bide my time until the other players are clumped closely together in a line, then try to take them all out at once. His level two super is his Divine Reckoning attack from God of War III where he jams the Blade of Olympus into the ground, sending a huge tornado upward, killing anyone caught in it. It's a really interesting attack because of its vertical nature, allowing you to catch players on platforms above you totally off-guard, and it's great for easily killing several players at once. Kratos's level three super transforms him into his god form from the opening of God of War II and allows him to lay waste to anything in his path. He uses the Blade of Olympus to net instant kills and can even fire projectiles from it, which is useful because he's also fairly slow in this form. It's a devastating level three super that you can get you a half-dozen kills in seconds if you play your cards right, but it can also be incredibly frustrating when the game breaks a little and Kratos gets stuck on an edge or misses over and over with his projectile attack and you end up only getting a kill or two. Kratos definitely has some balance problems to work through though, like finding a way to reduce the number of players who simply spam his forward lunge move. To execute it, you simply tilt left or right with the left analog stick and tap square, making it far too easy to pull off accidentally and far too quick to pull off purposefully. There are plenty of attacks in All-Stars that you can hold a button to charge up and modify and attack, so forcing players to hold the square button to use the lunge move would probably do wonders to curb its rampancy. As well, Kratos has always been about unstoppable forward momentum, but the first thing I had to do was train myself to stop always holding left or right when I wanted his basic attacks, which seems counterintuitive to me, but right now, it's between that and constantly spamming his forward lunge. So Kratos is probably the most overpowered character in the beta, but it still takes a skilled player to manage all of his abilities and put them to good use. Colonel Radec, on the other hand, is just cheap. Radec's biggest problem is easily his long-range sniper shot. It can reach across an entire stage, something especially problematic in the two stages in the beta which are usually pretty flat, giving Radec an easy lane to shoot down from far away. If you get hit with it, you'll fly away and be back at square one trying to move in close again. It's a fairly quick move to execute, even if it does have a comparatively lengthy windup, but even that can be mitigated by starting the windup during a jump. Most Radec players rely heavily on this move, staying on the opposite end of the map from the other fighters and harassing from a distance. It's annoying if you're in the fray, having to constantly worry about the Radec shooting you, so matches with a sniping Radec often devolve into "chase the Radec around." A sniping Radec demands attention: If you try to ignore him, he'll just keep spamming that same move from afar until he builds up enough super to activate his level three and run away with the match. You have to deal with him. With most characters, you're lucky if you get one level three super in a match, but I got my first level three super within the first minute, and another with a full 1:30 left on the clock. I'll admit, it was pretty hilarious on our end, but the two kids we were playing against were quite clearly not having very much fun at all. We both spammed Radec's sniper shot like it was our job, and with both of us staggering our shots to keep a constant stream going, neither of them could work their way in at all for almost the entire match. 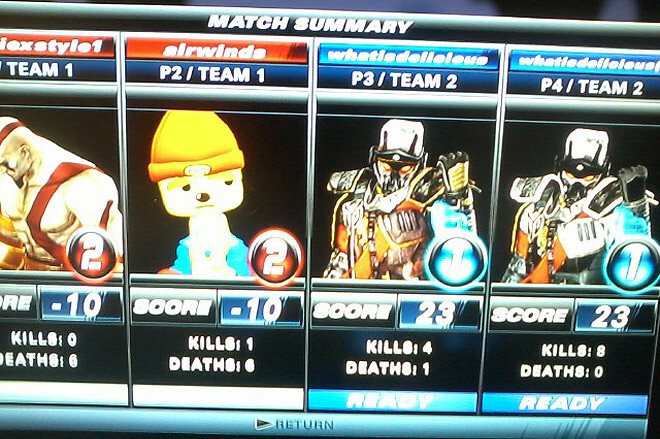 It's miracle enough that the Parappa somehow managed to get a kill in at all. Of course, Radec's sniper shot isn't his only move, but it certainly feels that way playing against most Radec players in the beta. Which is a shame, because he's got a decent arsenal of moves, and the few times I've played against Radec players that did more than just spam his sniper shot were actually pretty fun. Radec's other big problem is that he just doesn't feel at all like Radec. Killzone 2 culminated in a mano-a-mano knife fight with Radec, who spent most of his time stalking you while under a cloak of invisibility, only coming out to lunge at you with his knife before going invisible again and teleporting away. How SuperBot landed on Colonel Radec as a long-range sniper character, I'll never know. It makes even less sense when you consider that another character in the beta, Sly Cooper, totally does have invisibility and teleporting powers and Radec does not. Matches with a sniping Radec often devolve into "chase the Radec around." A sniping Radec demands attention. So yes, in theory, Radec has plenty of options that make him a diverse and dynamic fighter. He's best at a distance, but I've been cornered by players with a strong close-range Radec, and things very quickly got brutal for me. Most of Radec's close-range attacks are based in deception or raw power to put distance between the two of you again, but in the right context, you can get caught in a fierce loop that feels like you'll never get out of. 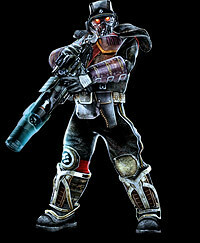 In addition to his sniper rifle, Radec is equipped with a machine gun, a shotgun pistol, and both sticky and shock grenades. The machine gun is a mid-range attack that doesn't do a ton of damage, but forces groups of enemies to deal with you. His shotgun pistol is pretty devastating, coming at the end of an easy one-two-punch combo with the square button that sends the other player flying away at the perfect trajectory for an immediate sniper rifle follow-up. It's a great way to establish boundaries in a match if you're playing a distance Radec, but it can leave you pretty open to attack if you miss. The easiest way to tell if you're playing with a good Radec is by watching how he uses his grenades; the best Radec players I've come up against have dominated me with grenades, not the sniper rifle. Radec can bounce a frag grenade forward, drop one on the ground where he stands and teleport a few feet away, attach a sticky grenade to other players, and throw out a shock grenade that can stop charging players in their tracks and give Radec invaluable time to respond. I would literally pay extra money for a limited edition of the game that just removes Radec altogether. His level one super is decent, tasking you with moving a reticle around the screen to highlight another player that a heat-seeking missile will chase. It's tricky at first since it's not immediately apparent what you're supposed to do, but eventually, you get the hang of it. His level two super is really good, a horizontal green blast that shoots across the screen and destroys anyone in its path. It's perfect for catching an entire group of players at once, an easy three kills if you time it right. But with Radec, it really is all about saving up for a level three super. Radec's level three has him don the jetpack from Killzone 3 and turns the entire stage into a shooting gallery as the player controls a reticle and begins annihilating everyone. It's well worth saving up for because it lasts long enough that you can often kill everyone twice before it wears off if you're quick enough. As of now, I would literally pay extra money for a limited edition of the game that just removes Radec altogether. He's such an annoying character to fight against, especially when there's more than one. They'll take up positions on opposite ends of the stage and you'll get caught in a pincer of sniper fire. Try to move in close to one and you'll get shot by the other. It's not fun. His sniper rifle needs more of a windup before he can use it, or it should have limited range or ammo, or it shouldn't make other players fly away as far, or it shouldn't generate as much super meter, or something. SuperBot has plenty of options to balance Radec, and they need to do something about it because most characters are wholly unequipped to deal with it. Kratos can reflect Radec's sniper fire back at him if he's quick enough with his Golden Fleece counter and Sly Cooper can go invisible and try to sneak behind him, but that's it. Sweet Tooth and Fat Princess are too slow to effectively deal with it from range, and while Parappa the Rapper is pretty quick, he's not quick enough. With those characters, it becomes about sheer luck trying to move in close and avoid the red laser sight in time. Kratos and Colonel Radec are both totally overpowered characters. It's painfully obvious when you're playing as them and dominating the other players, but it's beyond aggravating when you're playing against them and being dominated by them, a factor I hadn't really considered until I was playing the other characters for the next installments in this series. So yeah, Kratos and Radec both definitely need some work to curb how powerful they are because right now, it just isn't much fun to play against either of them, which is only exacerbated by how many people play as them. For the next installment, I'll examine Sweet Tooth and Fat Princess.